GATLINBURG, TN- Ole Smoky Moonshine announced today the national launch of a higher proof Ole Smoky Apple Pie Moonshine. The product was originally created at 20% ABV (40 proof). However, the company decided to take things to the next level by raising the proof to 70 proof (35% ABV). Apple Pie moonshine is one of the most traditional moonshine flavors, steeped in years of history. At 40 proof, it has been a staple for Ole Smoky and the best selling product for the company. Because of its huge success, Ole Smoky strategically decided to raise the proof. While the flavor has been slightly altered, the sweet taste of Apple Pie still remains. 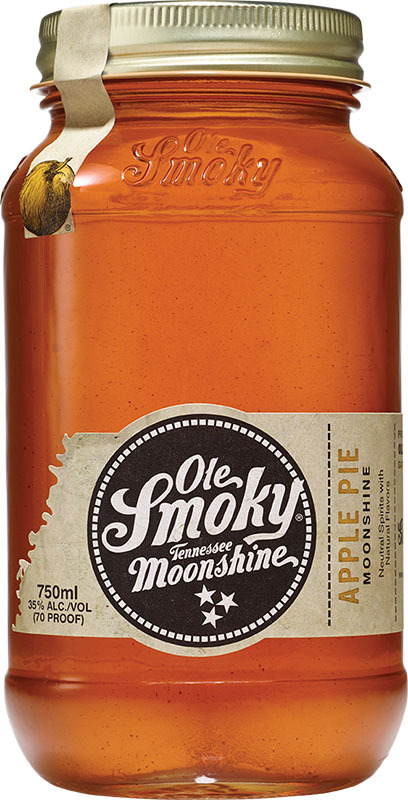 “Ole Smoky has launched many flavors in the past few years, but this year we are especially excited to hone our focus on our top flavor, Apple Pie,” says VP of Marketing, Meg Bruno. Ole Smoky is the leading distiller of premium moonshine in the U.S. and the first federally licensed distillery in the history of East Tennessee. The company’s roots can be traced to the early settlers of the Smoky Mountains. Which means this isn’t just moonshine. It’s moonshine made with authenticity and enduring pride of the people of the Tennessee Mountains. In 2009, the law in Tennessee changed and suddenly, it was legal to make, distill and sell the infamous bootlegger’s hooch. It was at that point that a group of families decided to bring their artistry of superior moonshine making to the world at large. And the world welcomed it. Ole Smoky was named an Impact Hot Brand by M. Shanken Communications, a leading publisher in the U.S. wine & spirits industry. The Hot Brand Award is given to both established and upcoming brands that achieve double-digit growth in each of the past three years, with a minimum of 200,000 cases. Additionally, people from all over the world visit our famed Gatlinburg Distillery, The Holler™ to see and experience how Ole Smoky moonshine is made. Ole Smoky now retails globally and offers fifteen creative flavors crafted from authentic family recipes. And while Ole Smoky has long been enjoyed on the porch from the jar or the jug, Ole Smoky now finds itself mixed in hand-crafted cocktails of the finest order in establishments across the U.S. including some of the biggest music and sporting events in the country. The future is bright. And we’re ready to shine on. For more information about the brand, please visit www.olesmoky.com and find them on social media @olesmoky. ©2016 Ole Smoky Distillery, LLC. All Rights Reserved. OLE SMOKY, OLE SMOKY TENNESSEE MOONSHINE and SHINE RESPONSIBLY are registered trademarks of Ole Smoky Distillery, LLC. Stellabrate the Holidays with Stella Rosa! Wicked Tango at Pub 1842 MGM Thatchers Gold English Cider, Innis & Gunn Oak Aged Beer Make the Holidays Sparkle with Diama Prosecco!